While Shinskie is not a college baseball player, he is an interesting two sport athlete. 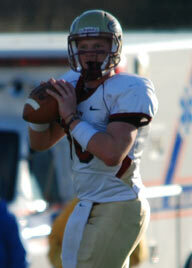 Shinskie is a 25-year-old freshman who is starting at quarterback for the BC football team. He was drafted in the fourth round of the 2003 MLB draft by the Minnesota Twins, and he finished his minor league baseball career in 2009 in the Toronto Blue Jays organization. He is not eligible to play for the BC baseball team. Shinskie passed for 1,831 yards with 14 touchdowns and 13 interceptions during the 2009 regular season. Boston College (8-4) will play in a bowl game. Collaros batted just .204 in 49 at-bats in 2009 for the Bearcat baseball team. However, he has had a much bigger impact this fall for the UC football team. Collaros has passed for 1,434 yards with 10 touchdowns and just two interceptions in 2009. He has also rushed for 344 yards and four more TDs. He has played in all 11 Cincinnati games in 2009, including four starts after Heisman contender Tony Pike went down with injury. Cincinnati (11-0) plays Pittsburgh (9-2) on Saturday, Dec. 5. A win would send the Bearcats to a second straight BCS bowl. Parker graduated high school a semester early to enroll at Clemson in January 2008. He’s a redshirt freshman on the football team, but he will be a junior on the baseball squad in 2010. Parker has passed for 2,294 yards with 19 touchdowns and 10 interceptions in 2009. Clemson (8-4) plays Georgia Tech (10-2) on Saturday, Dec. 5 in the ACC Championship Game. Nelson finished the 2009 season as Hofstra’s second-leading receiver with 40 catches for 520 yards and four touchdowns for the (5-7) Pride. Dornfried hit 7 of 9 field goals and 40 of 41 extra points for the Crusader football team this fall. He played in 15 games in 2009 for the Holy Cross baseball team. Like his former LSU teammate, Jared Mitchell (drafted and signed by the Chicago White Sox), Jones has both a football and a baseball national championship ring. Jones is LSU’s fifth leading tackler with 60 takedowns along with 3 interceptions. Jones is also averaging 21.5 yards on six punt returns, including a 93 yarder for a touchdown vs. Mississippi State. LSU (9-3) beat Arkansas 33-30 to close the regular season. The Tigers will finish their season in a bowl game. Peterson had 39 tackles, three sacks and an interception in 2009. He batted .366 with 16 stolen bases in limited action on the diamond last spring. Bronson led the Cowboys with 75 tackles in 2009. He also had two interceptions. 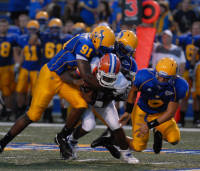 McNeese State lost 49-13 to New Hampshire in the first round of the FCS playoffs. Decker entered the season on the Biletnikoff Award Watch List. The award is given to the nation’s top receiver. He started Minneosta’s first eight games, but suffered a foot injury against Ohio State missed the rest of the season. Depite missing the Gopher’s last three games, Decker was still named All-Big Ten by a vote of conference coaches. He finished the season as Minnesota’s leading receiver with 50 catches for 758 yards and 5 touchdowns. totaled 3,027 passing yards with 31 touchdowns and 11 interceptions in 2009, while also rushing for 260 yards and 4 more scores. 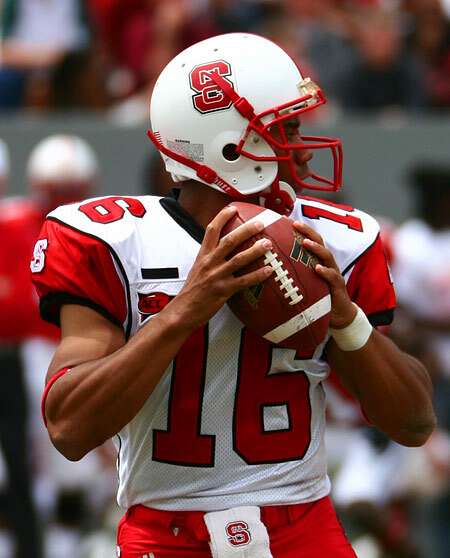 His 31 touchdown passes led the ACC. Tate is one of three finalists for the 2009 Biletnikoff Award. He’s had a record-setting season in 2009 with 93 receptions for 1,496 yards and 15 touchdowns (all single-season school records). His 2,707 career receiving yards are also an Irish school record. Tate finished the regular season with 10 catches for 201 yards and 3 touchdowns in a 45-38 loss to Stanford. The Irish (6-6) lost their last four regular season games, but they are bowl eligible. Tedesco is the Sacred Heart (2-8) school record holder with 37 career touchdowns. Tedesco had a career day with 12 catches for 144 yards and four touchdowns in the Pioneer’s season-ending 45-42 loss to Duquesne. He finished the 2009 season with a team-high 67 receptions for 865 yards and 11 touchdowns. He was selected to play in the 9th annuall East Coast Bowl All-Star Game. This is South Alabama’s first season of college football, which makes Cabrera the first player in the 45-year history of the USA baseball program to play football and baseball. Gerhart is one of three finalists for the 2009 Doak Walker Award, which goes to the nation’s top running back. He is also a top contender for the 2009 Heisman Trophy. Gerhart was an outfield starter for Stanford’s 2008 College World Series team. Gerhart capped his regular season with 205 rushing yards and 3 touchdown runs in Stanford’s 45-38 win over Notre Dame. He also complete his first career pass attempt for an 18-yard touchdown pass in the game. As of Nov. 29 Gerhart leads the nation with 1,736 rushing yards and 26 touchdowns. His 42 career touchdowns are a Pac 10 record. Gerhart has now topped the 200 yard mark three times this season. Coming into 2009 no Stanford back had surpassed 200 rushing yards in a game since 1988. Gerhart could exercise a fifth year of football eligibility (he missed most of 2007 with a knee injury) and he still has a final season of baseball eligibility remaining. However, he is expected to forego those options to prepare for February’s NFL combine and, ultimately, April’s NFL draft. McVaney made 12 relief appearances as freshman for the 2009 Bobcat baseball team that made it to the NCAA Tournament. The fullback had four carries for nine yards in 2009. As a redshirt freshman in 2009 he led the baseball team with a .346 average. Szczur was a 38th round draft pick by the Los Angeles Dodgers out of high school in 2007. He and the Wildcats have playoff wins over Holy Cross and New Hampshire & are now in the FCS national semifinals.